Well, that is what I said when I bought these oddly interesting beads over twenty years ago. And all I knew was aluminum is made from bauxite. Turns out there is a small village 60 miles north of Accra, Ghana, Africa, that maintains a relationship with the bauxite-bearing hills just 2 miles away. For four generations, the families of Abompe have the exclusive market on bauxite beads. The hills are also the abode of their guardian spirit who protects the village from over-exploitation of the bauxite. a kid drills holes in the beads with a spindle contraption made from wood and metal. someone polishes the beads on a grinding stone, resulting in a dull colored bead. The last step is the person who treats the beads with oil to make them shiny. 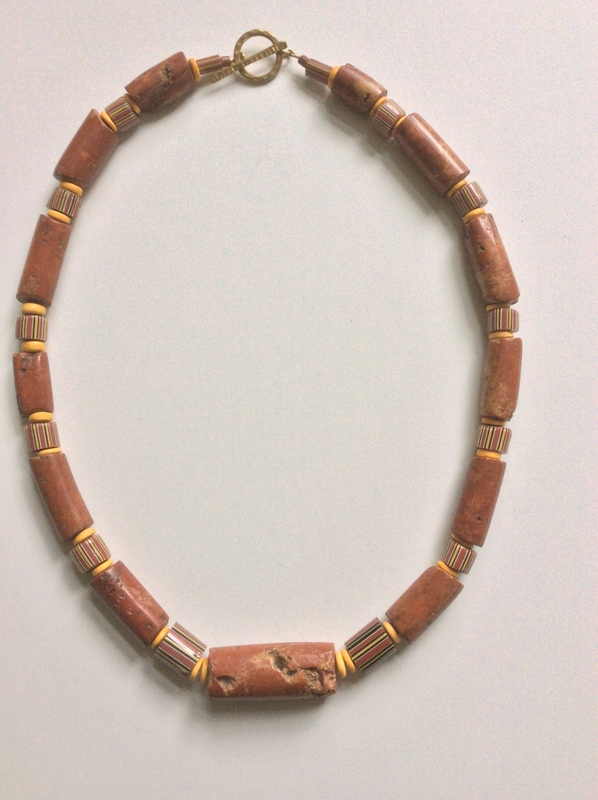 Back to the necklace I am presenting today, notice the natural crevices, especially in the center bead. BTW, these beads date from the early 1900’s. The brick color (from the iron naturally found in bauxite) continues to develop shine from the human necks who have worn these beads for the last century, minus the 20 years they have sat in my apothecary chest drawers. Other beads in the necklace are Mozambique glass trade beads and yellow-dyed coco beads. I am feeling compelled to tell you I bought the trade beads in a flea market in Lisbon, Portugal, in 1966 when Mozambique was struggling to gain its independence from Portugal. Believe me, I had no idea that 30 years later, I would be having fun designing bead necklaces! The clasp is hammered brass. The necklace measures 26″ and weighs 6 oz. $89.